Appearance: https://i.imgur.com/nNC3xu7.jpg Almost immediately any pony would take notice that this batpony mare is missing her hind right leg, upon further inquiry one would probably learn that she lost it while swimming out in the ocean to a large serpent. It is wrapped in gauze at all times, though that's mostly because the stub looks pretty ugly. Apart from that Airborne Waters has a coral blue and midnight blue mane with a blue-tinted dark grey coat. Her eyes are also, very surprisingly, blue. Cutie Mark: A black lined star with the two outer points to the left and right being completed by waves of colors corresponding to her mane. It symbolizes her hardworking spirit. About: Insecure, but also unwilling to be insecure. Airborne tries to overcome her fears and conquer her worries, though when that fails, which it often does, she feels more ashamed than before. Though she has learned to fly exceptionally well and has never really failed at things related to flying despite her missing leg throwing off her natural sense of balance. 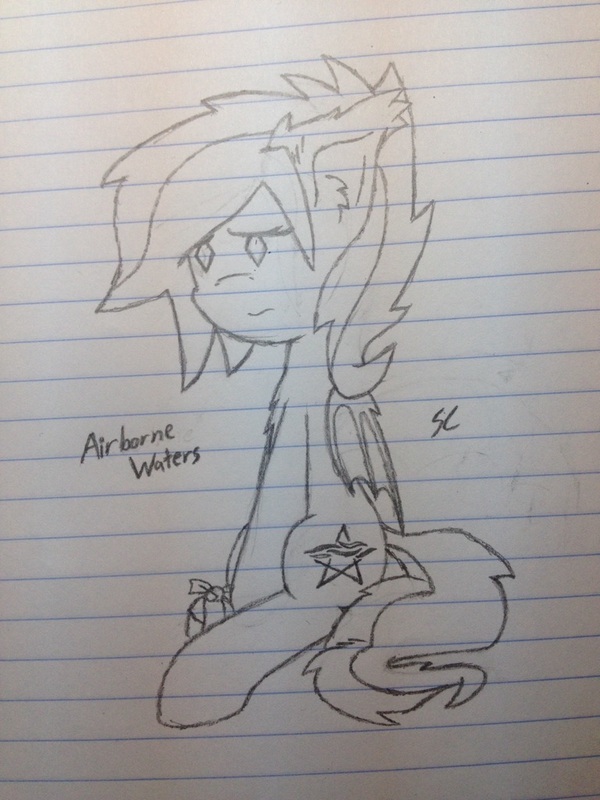 Airborne Waters also tries to make friends, though she has troubles doing so because of her concern about how she would appear to the other pony. Traits: Insecure, dedicated, awkward and self-conscious. Likes: Taking walks (or hobbles), reading, playing the flute, etc..
Dislikes: Irrationability, brash decisions, failing, the sea shore, etc..
My batpony eyes are diamonds, and I also give their ears extra floof as is customary. And despite this pic not being too old, it is obvious that I wasn't at the top of my game when drawing that.